David had something I desperately sought after - turkey hunting knowledge. Originally hailing from the southwest portion of West Virginia, when I grew up there, the woods were free to hunt but also free of turkeys. We had a hunting camp in the eastern part of the state and I had taken a few turkeys in the fall, but had never hunted during spring season. After moving away from my home state, first to Florida and then to the extreme south central portion of Georgia, I found turkeys but all on private property. It took a couple of years to figure out the hunting lease situation and make connections when I moved to Georgia. After getting on a lease, on the first morning’s scouting trip in early March, I heard turkeys gobbling from all points of the compass. If this had been war, they had me surrounded. I would have been a goner. The other guys on the lease were deer hunters and few had interest in turkey hunting. The stress of work, worry about finances, disagreements with the wife; all these things lifted with the fog that morning. All was right with the world in those 3 weeks before the season opened. There are several stages to a great hunt. The first stage is the months of anticipation leading up to the season opener. The next stage is the couple of weeks before the opener filled with hours of preparation getting gear ready. This includes browsing through catalogues and trips to outdoor stores. Then there’s the sleepless night before, and if you’re lucky, the camaraderie of hunting companions and a big breakfast on opening day. There’s the drive to the place you’ll hunt and the thoughts or the conversation of the game you’ll be bringing home. On the stand there is the wait for day to break as you listen to unknown creatures rustling leaves and straining to make them out in the dark. As the hours count down to the final minutes there is the ever so faint promise of dawn in the east as the stars seem to scurry off before the encroaching tide of the sun. Then that big buck steps out, or the dogs strike, or the gobbler flies down and you hear him coming closer with every answer to your sweet yelps. Finally that gobbler is so close, his thunderous gobbles so loud you feel you’re in a cathedral with the sound of a heavenly choir bouncing off the columns of the thick live oaks that surround you. Out of the ether he materializes and you answer with thunder of your own. He lies flopping in the dirt and you feel that rush just before the regret. Seasoned hunters know it only works that way maybe once every few years, if that often, and more often by dumb luck than skill for most of us. That’s what I liked about hunting with David. Unlike me, his passion was matched by his skill. He could make a perfect plan and execute it. At the time, I wasn’t even aware of the mistakes I made. I did manage to bag a couple of birds that first season, but more by grit than plan. I had heart but no skill. When I called, I seemed to say in turkey language go the other way, or hold up just out of range, or at times, just plain, shut up. David may have thought I was being magnanimous had he known I paid for his membership on the lease that second year I was a member before I asked if he wanted to join. But in fact I was being very selfish. I knew it would give us an opportunity to hunt together and the knowledge I would glean from him would be priceless. David and his hunting partner Jimmy Whatley had already guided my oldest son to his first turkey and I had screwed up a solo hunt they took me on. They always guide for free and it’s by invitation only. This is their ministry. They are turkey hunting evangelists and I wanted to be their disciple. So I was overjoyed when David called me up and asked if I wanted to take Luke, my youngest son (10-yrs.-old at the time), out to the lease Saturday morning. Of course! So David laid out the plan. He and I would set up his 2-man pop up blind on the edge of the middle food plot the evening before. There were a couple of gobblers using that field and we would sit in the blind that evening, not calling so as not to disturb them at all, and film them flying up to the roost. He and Luke would hunt there the next morning and he would film the bird flying down and Luke bagging the bird after David enticed him closer with his calls. I would hunt elsewhere on the lease because the blind was so tight, and join them when I heard the shot. Friday evening it was warm in the blind with mosquitoes buzzing our head nets before the thermocell finally chased them away. The only birds in the field were crows as I picked David’s brain in hushed tones until about 30 minutes before sunset. A lone hen followed by a gobbler walked into the field. The bird looked big but he had what appeared to be a jake’s beard although it was hard to tell for sure with the angle and the fading light. It wasn’t long before both birds flew up into a large live oak draped with Spanish moss that leaned over a creek which bordered the south end of the field. We waited until after dark before backing out of the blind and taking the long way back to the truck so as not to disturb the birds. David filmed great footage of both birds in the field and then on the roost which included the gobbler gobbling several times, so evidently not a jake after all. In my mind’s eye I can still see that bird framed by Spanish moss silhouetted against the orange of a fading sunset. And if the memory should ever fade, I have a copy of David’s video to remind me. Luke’s excitement was extreme when I told him about the bird we had roosted. The hunt was a slam dunk I told him. All he had to do was shoot straight with the Berretta 20 ga. he would be hunting with. My heart hurt a little when I parted ways with Luke and David the next morning. I was jealous that both my boys would take their first turkey called in by someone else. I set my heart on learning more and learning quickly so that I could call in their next several birds. It was dead still and humid for mid April in South Georgia. I thought about the mosquitoes that would have gathered in the blind overnight and how David and Luke would be faltering in the close confines of the blind trying to find their seats and setting up camera equipment in the dark. Where I was hunting was a good 15 minute walk, far enough not to hear Luke’s bird gobble on the roost but plenty close enough to hear the shot. I settled in on the edge of a field that bordered the same creek Luke and David hunted on. Normally owls call actively just about the time you realize that light in the East in not your imagination. Sometimes a randy gobbler will cuss back at them. But most mornings the gobblers wait until the first crow calls. Then it’s on. I did my owl hoot and best tree talk before full light to no avail. I called intermittently until I became boared. Then I lit it up with excited yelps, clucks, and cuts. Before long I had used my full repertoire including kee, kee runs. After shutting up for about 20 minutes, I was about to use a crow call to see if I could get a shock gobble when a hen about 30-yards behind me called. I matched her cadence and she called back. In college I volunteered in a campus choir. If I was called on during practice to sing alone, horrible croaks came out. I’m afraid my turkey calling was the same. Alone I was horrible but I could match the voices around me. This morning I may have been singing in Latin and had no idea what I was saying but I matched the hen and she flew down into the field. As I watched my hen in the field waiting for a gobbler to step out David was performing soprano to the roosted gobbler’s lead tenor in an opera all their own with Luke and the roosted hen their only audience. David filmed the gobbler on the roost as the sky lightened, first in silhouette and then in full sunlight as the rising sun glinted off its iridescent plumage. After awhile, both birds flew into the field out of range but working their way toward the blind. But then the hen veered off toward the creek with her beau in tow. 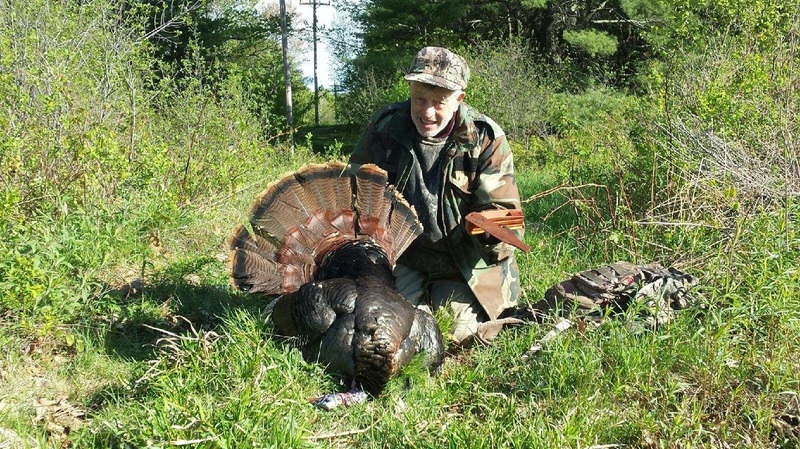 By this time David had been able to zoom in on the gobbler’s beard and it was either broomed off or the bird was a jake. The bird’s spurs were hidden by the grass. Some birds mature quicker than others so this could be a gobbling jake. Luke’s older brother, Zach’s first bird was a big gobbler. Luke didn’t want to settle for an immature bird. When David called another gobbler answered and seemed to be headed toward the field. The gobbler in the field answered and ran to the edge of the field to cut off the interloper. No jake would act this aggressively toward another bird. This was a boss bird, old with a broomed off beard. As the old bird gobbled at the edge of the field the other gobbler shut up. David called and the old bird moved toward the blind. But half way there the hen called and the gobbler stopped. David called and the old bird moved a couple steps closer. Then the hen called again and the old bird watched as she walked toward the creek. By this time the old bird was within range but David had hoped to get him closer. You could almost see the wheels working in the old birds brain as he tried to decide whether to seek out the sweet sounding honey at the edge of the woods or follow the familiar hen he dad spent the morning with. He decided to go with the sure thing and turned to follow the hen moving toward the creek. “Shoot when you’re comfortable,” David told Luke. It seemed like forever and David was just about to tell Luke to hold up when he squeezed the trigger just as the old bird was at the outside edge of the 20 gauge’s range. The old warrior lay flopping in the field. David made sure Luke put the gun on safety and they climbed out of the blind to celebrate. But as they were coming out of the blind the old bird recuperated and and made a beeline for the creek. Before David and Luke could recover their wits the old bird disappeared into the creek bottom. One shot, that usually means success. By this time my hen had fed out of sight. I walked with a skip in my step on the way back to the celebration. But then half-way there I heard another two quick shots. What did that mean? By the time I arrived at the truck David and Luke were arranging one big wet gobbler for pictures. After high fives and hugs all around they told me the rest of the story. After he old bird ran down to the creek, David and Luke searched for him around dead falls and palmetto thickets. After circling back to not far from where he entered the creek bottom the bird flew flushed out from under a log and made if half way across the creek before David dropped him with two quick shots from his 870. They had to fish him out of the creek with a limb. The old bird’s feet were arthritic and to go along with a broomed off beard, his spurs were mangled. With his feathers all wet, this was one pathetic looking bird. But he was a great trophy and I couldn’t be prouder of Luke or more thankful to David for making it all possible. I will probably never be as good a turkey hunter as David Neck and Jimmy Whatley. But I’ve learned enough from them to make a plan and occasionally follow it to success. And although it took a few years, I’ve called birds in for both my boys to prove it. Thank you David and Jimmy! ​I was given a lynch box call from a man I did a job for. I was 15 years old. I'm 30 now using the same call. Best call I have ever heard In the woods. I've hunted turkeys now every spring for 15 years straight and have had success personally and for calling for my friends and family. We are hunting northern California both public and private land. 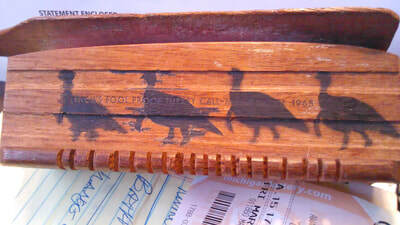 I have a ton of pictures with the box call and turkeys. Triple beard. 11-7/8 in beard. My wife's first bird 10 in. Your box call is the best!!!! If you have a hunting story or any adventure you want to share, please send us your memories by uploading it with the "Upload new File" and include a picture or two to make it more interesting. If you are using a Lynch call or camo, please be sure to include it too, especially a picture. We look forward to getting your story and posting it for others to read. 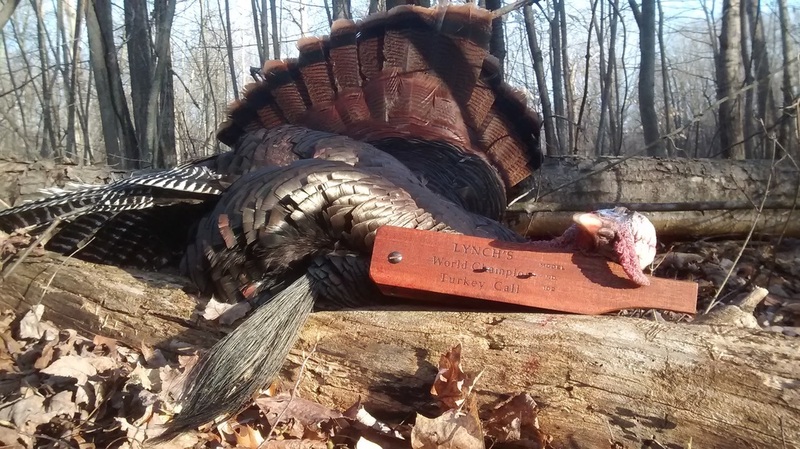 Love the Turkey call, he did too! Thanks so much for the 2003 Deluxe Fool Proof. It's very close to my broken one in pitch and sound. I'm extremely happy and amazed that you not only found one from 2003, but you didn't even charge me for it! You're something special in this day and age. You've got a great company too and I'll tell everyone I know about it. Thank you for the turkey call. I will need this for turkey hunting. PS: I will send you a picture of my turkey. Thanks again. I wanted to thank you for the turkey call that your company made for Tyler Jones. He really appreciated it. He is planning on using it when he goes turkey hunting on April 12. I wanted to take just a minute and personally thank you for your kind donation. A memory from my childhood..... My grandfather and I were coming out of the woods carrying an"Old Tom". Two fellow turkey hunters were passing by in a pickup and slowed down to admire the bird. One man said,"I don't know how you do it. What's your secret? This a picture of my neighbor John Bernard. I called this turkey in using the Lynch box call that I received through the Winchester Rebate. The call worked great and John was thrilled with this bird. Met Charlie Ward at the NWTF Convention in Nashville. He could not have been nicer. I was getting my turkey hunting gear together today in preparation for the 2018 Michigan Spring gobbler hunt. While looking at "Old Reliable", it brought back many memorable hunts. Hunts that were shared with family and friends, some still with us and some who are not. My Dad was an avid turkey hunter back in the day in Pennsylvania. 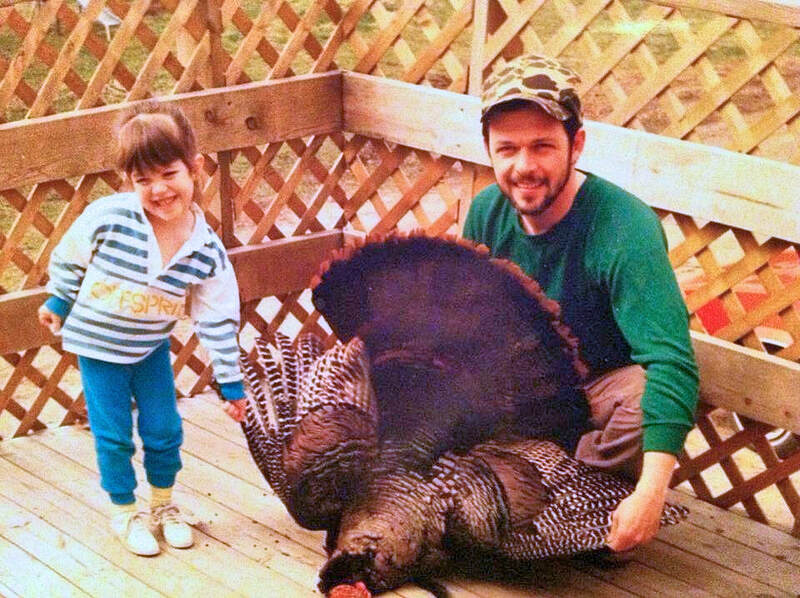 This love of turkey hunting was passed down to me. 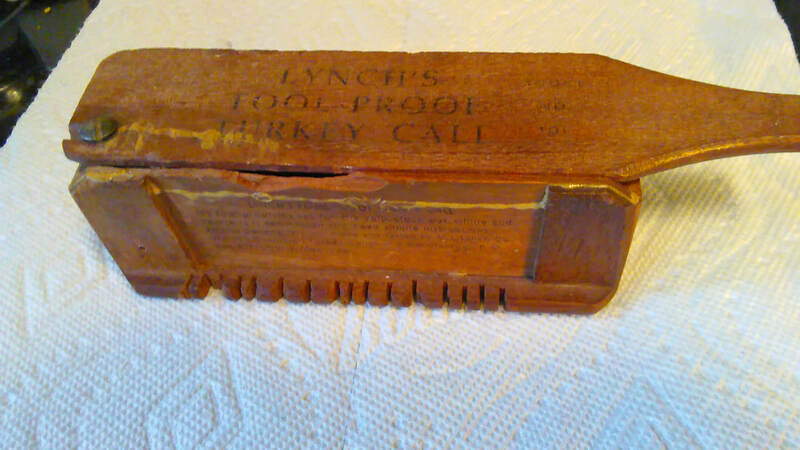 All these memories are a result of your product, Lynch's FoolProof Turkey Call. I really don't know exactly when I bought it but it's stamped 1965. Currently there are 34 notches total, representing birds that I have shot and Tom's that family/buddies have taken. Eyelet screws are gone as well as some wood and has been glued a few times. This call still sounds good and at times have out called slate calls. I have used the diaphragm calls and the slates but they don't get the response that your call gets. One hunt, I got to my ground blind at o'dark thirty, making sure I had plenty of time to let things settle down before first light. Wouldn't you know, near daylight, a truck zoomed down a two track to my right. A moment later, one went down a dirt road to my left. I just finished tree yelping to toms directly in front of me, had him responding but they would have to make it by the other hunters. They started in with the states, squeaking and scratching away. The toms went silent. I waited till they finished their flurry of calls, stroked the Fool Proof 4 to 5 yelps and the toms exploded again. This scenario went on for a while till there was a boom from about 10 o'clock. Hunt busted so I thought. Waited and called and received a response. Ended calling that gobbler between the two hunters and within 20 yards. I have attached a pic of my call. I plan on passing it on to my son or grandson. It's a hard choice. For now, I'll be heading back to the woods but not without my Fool Proof turkey call. Not ready to give it up yet. Thank you for a great call and unforgettable memories. My son Will has killed a couple gobblers with me, but this was his first solo hunt. As he prepared his gear he packed his Lynch Fool Proof box call. He had decided on a midday hunt and got to his blind at 12 o’clock noon. He called off and on every 20 minutes. Never heard a gobble but at 1:50 pm a strutting Tom showed up. After a good shot, he had a successful first solo hunt. 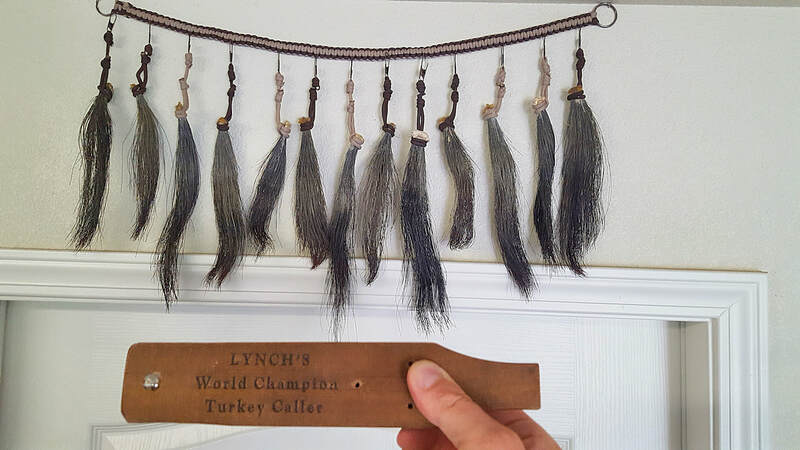 I’ve always used a Lynch box call, and now my son loves his. His bird had a 10 inch beard, 7/8 inch spurs, and weighed 20 lbs. 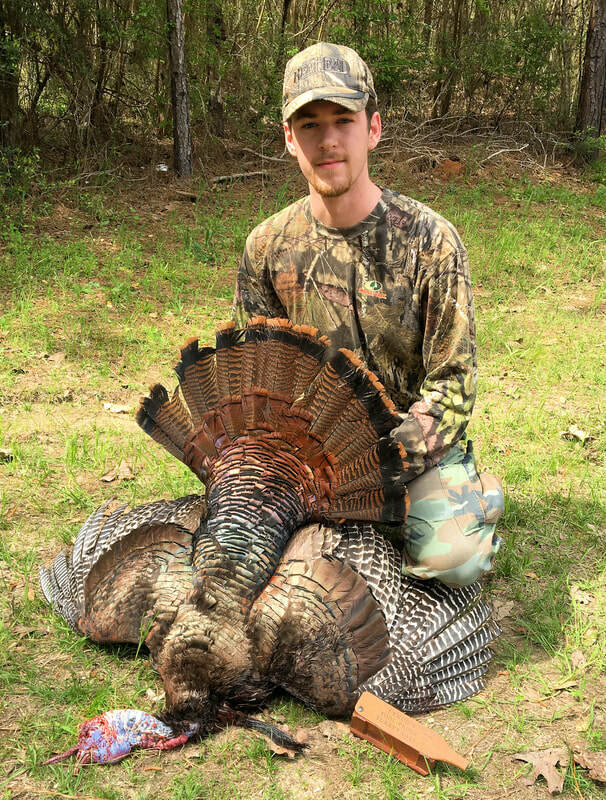 ​I am new to turkey hunting. I bought one of your Fool Proof box calls. It was easy to produce a good yelp with this call. The instructions that came with the call were very helpful. I was able to concentrate on call cadence, volume, etc. to get toms to respond to my calls. On the morning of the third day of my hunt, I called a tom in from a long distance and got my first turkey. You make a great product.